Where do I use my Cotswolds Hideaways voucher code? Cotswold Hideaways provide properties in various areas of the Cotswolds including Bourton-on-the-water, Broadway, Bath, Burford, Cheltenham, Chipping Campden, Chipping Norton, Lechlade and Moreton-in-marsh, as well as a selection of surrounding villages around these areas. There are all kinds of cottages and holiday homes available in these areas, suitable for all sorts of requirements. Many of the Cotswolds holiday cottages available are dog-friendly, suitable for young children, or perfectly located for walking, birdwatching, cycling or sailing. Cotswold Hideaways also offer many short-let opportunities in holiday accommodation suitable for different sized groups including idyllic cottages for romantic weekends, or larger properties for groups, family gatherings, weddings and special occasions. There’s plenty of things to do in each location where Cotswold Hideaways let their properties too. Activities include walking and hiking in the country, afternoon tea in quaint villages in places like Bath and even attractions like historic houses, zoos, wildlife parks and gardens. So whether you’re looking for a cosy cottage for two where you can enjoy birdwatching and walks, a dog friendly house in an area suitable for children, luxury barefoot retreats or a family-friendly property close to town, Cotswold Hideaways have it all, as well as complete expert knowledge of the beautiful areas each property is located in. At Cotswold Hideaways not only can you find properties to stay in, you can also rent your property out to other people. By joining Cotswold Hideaway’s scheme you can earn fantastic commission with each customer that stays in your cottage, there’s no joining or exit fee and you can do as little or as much as you want in terms of advertising and renting out your property. If you’re interested in making some extra cash with your holiday home in the Cotswolds then fill out the form on the Cotswold Hideaways website. You’ll find all the information you need about renting your property on this page as well as helpful contact numbers that will allow you to get in contact with Cotswold Hideaways experienced property managers. If you’re looking to splash the cash at a luxury holiday cottage, you can find just what you’re looking for at Cotswold Hideaways. There are over 7 unique, luxury cottages available on the Cotswold Hideaways website, located all over the Cotswolds in areas like Blackwell, Broadway, Upper Oddington, Broad Campden, Stourton, Rendcomb, Paxford and Chipping Campden. Choose from beautiful holiday homes that are surrounded by stunning natural beauty and the fresh air of the country. Discover luxury cottages with chic interiors, as well as huge manor houses, country homes with swimming pools, homes with over 15 acres of land and even thatched stone houses dating all the way back to the 17th Century. All of the luxury cottages available at Cotswold Hideaways are extremely beautiful and of the highest quality, located in stunning areas that offer plenty of idyllic scenery and things to do. Bath is one of Europe’s most historic cities, celebrated worldwide as a UNESCO World Heritage site. It has the most complete Georgian architecture of any city – and whether you want to explore its rich Roman, Georgian or Regency heritage, its great boutique shopping, or its fantastic pubs and restaurants, you are sure to have a fantastic getaway in Bath. Explore the history, nature or even the high street, or if all else fails then take a dip in naturally hot spa water. Whatever you’re looking to do, it’s all there waiting for you in Bath. And if Bath seems like the place for you, ditch the bog standard hotel or BnB and opt for a stunning holiday home that’s just as exciting and interesting as the area of England you’re visiting. Yes, some of the cottages do welcome dogs. 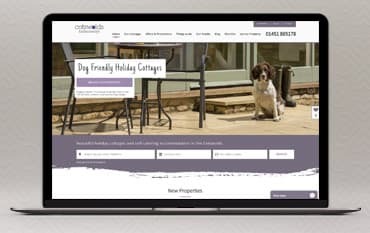 You can view the selection of dog-friendly properties on the ‘Dog-Friendly Cottages’ web page. Please do let Cotswold Hideaways know if you wish to bring your pet and they do ask that dogs are kept downstairs, off furniture and that any mess is cleared up before departure. Pets should not be left alone in the property. For the full details of Cotswold Hideaways cancellation policy please see the full terms and conditions page. Cotswold Hideaways provide a range of properties in and around the Cotswold for you to enjoy. From cosy cottages crammed full of country charm to luxury retreats oozing with natural beauty, you can enjoy weekend breaks or a couple of weeks away in this stunning part of the UK with your friends, family, partner or even your dog! Book your stay online with a Cotswold Hideaways discount code from us and save money on your getaway. You can also discover how you could earn money by letting your property in the Cotswold out too. We are constantly on the hunt for Voucher Codes for Cotswolds Hideaways to help you with your money saving. Our experts check dozens of sites for secret codes including NHS discounts, student sites & social media channels saving you time & money!